The moment of truth! The year-long battle for the White House is coming to its conclusion! Tomorrow, voters in all states will determine the next US president in one of the most unpredictable elections in US history. Many people will be celebrating and many will be disappointed when the final votes are counted a little over 24 hours from now. Donald Trump managed to achieve a miraculous recovery of his campaign just 2 weeks before election day. Currently, Hillary Clinton has about 76% chance of winning the election. 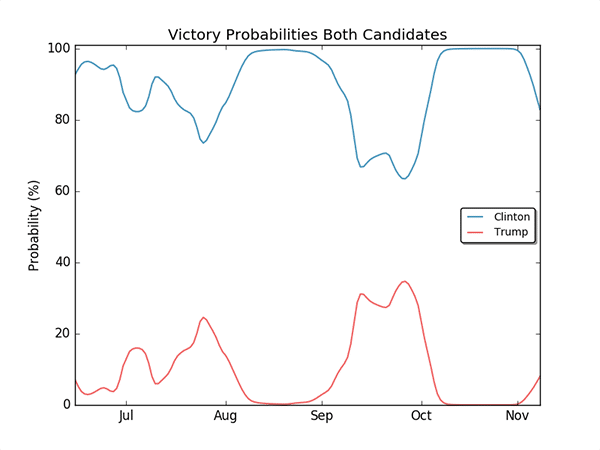 Donald Trump’s chances for a direct win are about 11%. There is also a significant probability of 13-14% for a tie between the candidates, which would send the contest to the US Congress! So, this is our final update to the main post from September 20. Please click on the link for a detailed description of the election process and how we model it to make the predictions you see below. Click here to go back to the daily predictions page. You can click on the date above the map to check the predictions for other dates. You can also click on different states on the map to see our state-specific predictions. 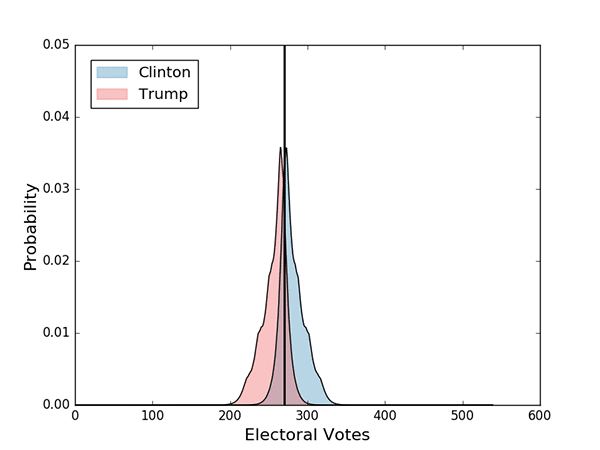 The following plot shows the evolution of Hillary Clinton and Donald Trump’s general election win probabilities. In the next two plots vertical lines mark the dates on which significant events occurred. By significant, I mean events related to a candidate that caused significant controversy and received significant attention by mainstream and social media. 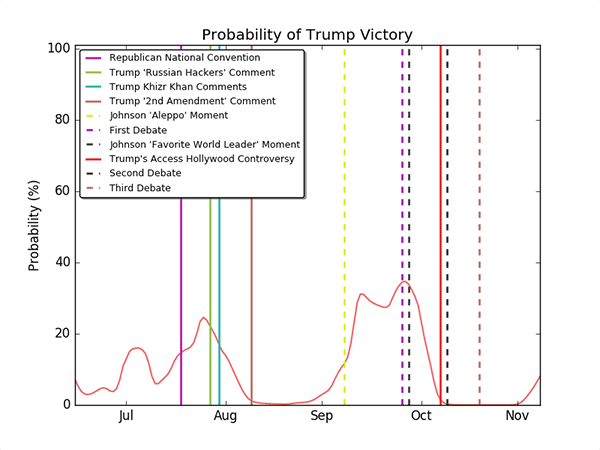 To me, these are the most interesting plots because they can give insight about voters’ actual reactions to the events which circulated around media. Each event is shortly described after the plots. Trump ‘Russian Hackers’ Comment (July 27): Donald Trump expressed hope that Russian hackers would be able to get access to Hillary Clinton’s deleted emails. This sparked controversy, as it was perceived as if he was openly inviting foreign hackers to try to get access to classified material. Watch video. Trump Khizr Khan Comments (July 30): Donald Trump’s response to Khazir Khan’s (the father of a US soldier who was killed in Iraq in 2004) speech at the DNC also sparked significant controversy. Trump remarked that the likely reason Khan’s wife did not speak during the Convention was the typical treatment of women in Muslim families. Watch video. Trump ‘2nd Amendment’ Comment (August 9): During a speech, Trump made remarks that were perceived as him inviting people to use violence towards Hillary Clinton (or somebody else) in case she becomes president and gets to choose Supreme Court judges who are unfriendly to the Second Amendment to the US Constitution. Watch video. Clinton ‘Alt Right’ Comment (August 25): Hillary Clinton talked about (and significantly popularized) the so-called Alt-right, during a speech in Reno, Nevada, which was perceived as divisive rhetoric. Watch video. Johnson ‘Aleppo’ Moment (September 8): During an interview, Libertarian candidate Gary Johnson revealed that he did not know the city of Aleppo, one of the most affected areas by the Syrian civil war. This was perceived as unacceptable for a presidential candidate. Watch video. Clinton ‘Deplorables’ Comment (September 9): During another Hillary Clinton speech, she made remarks that were also perceived as divisive. She claimed that half of Donald Trump’s supporters are “deplorable” and “irredeemable” people. Watch video. First Debate (September 26): The first presidential debate was held in Hofstra University, Hempstead, NY. 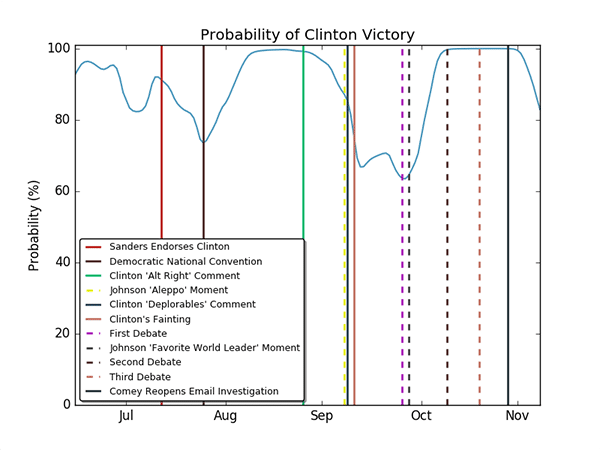 According to most opinion polls, Hillary Clinton won the debate convincingly. Watch video. Johnson ‘Favorite World Leader’ Moment (September 28): In an interview on MSNBC, Gary Johnson failed to name a favorite world leader which added to the perception of him being unprepared on foreign policy issues. Watch video. Second Debate (October 9): The second presidential debate was held in Washington University, St. Louis, MO. Hillary Clinton’s performance was largely evaluated as even better than the first debate. Watch video. Third Debate (October 19): Donald Trump’s debate performance was highest in the final debate. This managed to resurrect his campaign which was in quite bad shape at the time. Watch video. If you’ve been following our previous update posts, you’ll notice how much the overlap between the two distributions has grown in only a month! Let’s all stay tuned and follow the culmination of this exciting and nerve-racking election! Don’t forget to check the main post tomorrow for the final updates of our predictions on election day itself. Waking up in the middle of a nightmare! What happend? The underdog surprised us all! Enter your email below to receive updates and be notified about new posts.